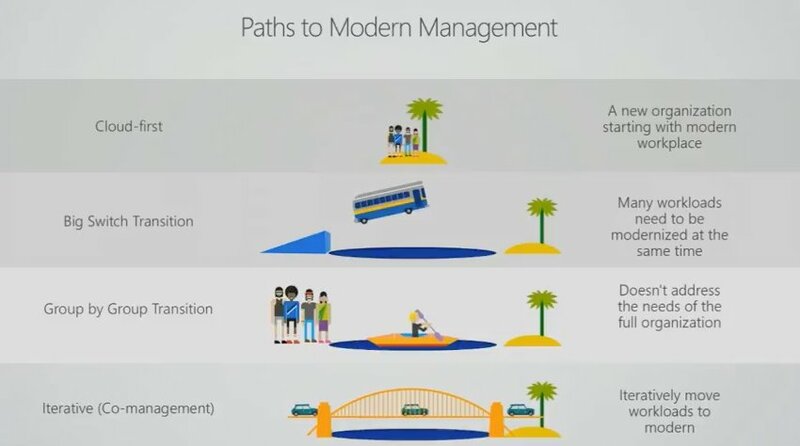 Co-management does not require a hybrid infrastructure of SCCM connected to Intune. It actually requires each platform to run in standalone mode. That means that if you have a hybrid environment, you will need to migrate to a standalone Intune model. Not all workloads are available in both platforms so you will need to choose what makes sense to move from SCCM to Intune. For instance, Win32 application management is easier in SCCM and most organizations already have an established release management process around it. Compliance policies on the other hand are often better suited to be managed with Intune as it provides a richer experience and more advanced controls for things like Device compliance policies, Resource access policies, and Windows Update policies. In other cases, the workload may not be available to be migrated to Intune or may not be an easy transition. Examples include Endpoint protection and Operating System Deployments. If you have a requirement for upgrading Windows 7 devices to Windows 10, SCCM is still the best option. Are you going to start with Intune managed devices and then add the SCCM client or are you going to start with SCCM Managed devices and enroll them into Intune? Ho do you want to address non-Windows 10 devices? As exciting as new technology is, there is always value in understanding your use case scenarios and requirements before embarking on any new initiative. As a friend of mine constantly reminds me, “Businesses don’t care about the use of innovative technology but the innovative use of technology”. This entry was posted in InTune, MDM, Windows 10.